Have you ever been turned down for a loan? Had your credit line slashed or interest rate bumped up? Well, starting Thursday, banks and other lenders will be required tell you a bit more about why. Thanks to the Dodd-Frank Financial Reform Act, the Federal Trade Commission and Federal Reserve Board are implementing a new rule requiring lenders to show consumers the credit score data they used to make their decision. 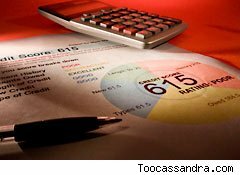 In addition to the score, creditors must also give the score range, the date score was generated, up to four contributing factors that affected score, and which agency issued it. The new Consumer Financial Protection Bureau, which opens for business on July 21, is responsible for enforcing the rule. For consumers, this is good news, as it adds a new level of transparency to the credit process. But when it comes to getting a credit score, it's a little like getting your test result without seeing the grading curve, says Erik Larson, president and founder of NextAdvisor.com, a consumer information resource for online services. "It may create more confusion than before because it will be difficult to put [the score] in context," he says. Credit scores are calculated using a complex construction of formulas and factors, based on the information in a consumer's credit report, as well as additional information. Some lending companies use proprietary scores, based on in-house formulas, while others use brand-name scores, like FICO or VantageScore, which they buy from the major credit reporting agencies: TransUnion, Equifax and Experian. Both FICO and VantageScore have their own scale and formulas for creating a score. For example, a 660 FICO score, based on its 300 to 850 scale, is relatively higher than a 660 Vantage score, which is based on a scale of 501 to 990. Variables such as the number of recent credit inquiries, late payments, liens, and so forth can impact a credit report and score on fluid basis. As those factors shift month to month, so can an individual's score. "It's a moving target," says Larson, who advises consumers to check their credit score before applying for a loan. "If it's not good, you have time to improve it. Once you apply, it's too late and even applying can lower it. This way, you can apply with confidence."